Holy Toledo! It has been such a long time since I have chatted with my friends here! I gotta tell you, I am a busy man. So much has happened! From baseball to BMX to learning to ice skate to changing schools..I don't know where to start! I am doing so great that my peeps can't keep up! First Grade is a huge success story for me. I was going to a special ed class in a great school that was in another city a half an hour away because that was all that was available for me. My mom and the teachers and my whole team worked really hard to have me transferred to the school in my town - to the same school as my big brother! I am now in a regular First Grade class but I have an aide and am able to go to special ed during the day, too. I am still learning the ropes. Sometimes it is super hard for me to SIT and hang out and I want to go for walks and say hello to everyone. But I am trying! It's just so COOL that I have a chance to try. Isn't that amazing! Another cool thing that has happened since we chatted last is that LOTS of kids with chromosome stuff have contacted us. Kids from all over the world who are like me in a lot of ways. Some even have super similar deletions! Wow! Mom got a call this week from the genetics department, my homies up at Stanford. 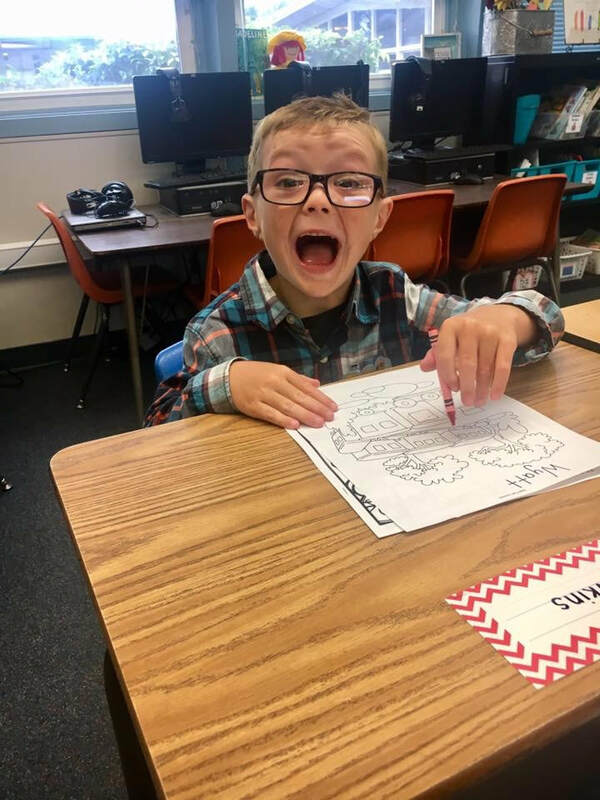 Here's what Mom says: "We’ve talked with genetics and the case study done on Wyatt and kiddos with deletions extremely close to Wyatt’s is complete! It is an overwhelming feeling of hope. 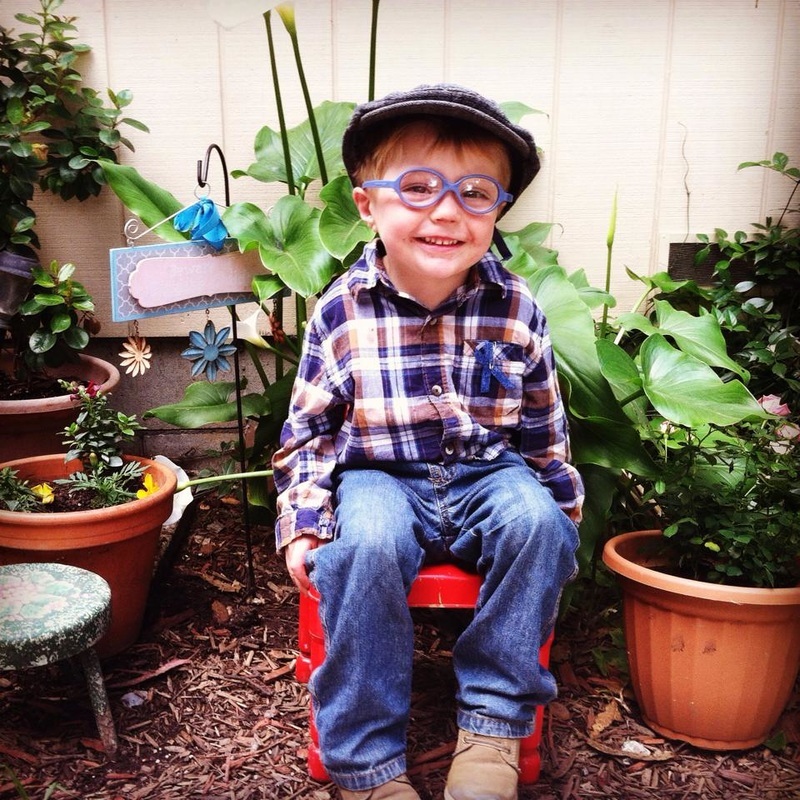 We are grateful to be able to help future children who are diagnosed. Those children and their families will be provided information that wasn’t originally available to us. We hope that it gives them comfort in knowing that they are not alone." Dude! I'm famous!! Is that cool or what!? Hopefully, Gammy can figure out how to add a link to the report on the website here, to pass along the important things that the genetics peeps have figured out about the effects of the deletion. Gammy promises we will work on adding more to the site, I really want to continue to share my story so new friends can see how all the hard work I have done has really helped me grow and be the best ME I can be! Look for more news soon but in the meantime, give yourself a high five and have a happy holidays! Good News Everyone! Here is Mom's report after our trip to Lucile Packard Children's Hospital for the dreaded swallow tests! Guess what! For now, no more Barium concoctions that they try and pass off as "milkshakes" Soon, no more thickener in all my drinks! Yay! "Stanford trip for a fluoroscopy! I literally wanted to jump up and down it went so well (as far as the results Wyatt still isn't fond of the procedure). So far no signs of aspiration or silent aspiration!! One spot where he penetrated but that's all they've seen so far! Night and day from our last one less than a year ago which had horrible results. She gave us permission to lessen the amount of "Thick It" in his cup and to start introducing open cup and water. I could cry! Feel so blessed.. Follow up with gastroenterology in a couple weeks to discuss results and his reflux!! We have such an awesome team of doctors!" So how does a kid like me get so lucky? Not only am I getting more and more handsome every day, my natural athletic ability is starting to shine through! Thanks to the Challenge League for making it possible for me and my peeps to hone our skills and have a ton of fun. I met friends of all ages learning to play and I had a "buddy" who played alongside of me and helped me to not feel nervous and stuff. We even got to play with the high school kids AND a game against the firemen. (They need practice). So what were some of the challenges for me to play baseball? Sometimes I get bored standing in one place. I need to move around, but I learned from my buddy to stay in my position...mostly. I also can get edgy when there is a lot of stimulation and Mom had to step in quite a bit. I get a bit fearful and emotional, but I noticed lots of the kids on the team, no matter what their disability, had that same problem, too, and everyone was patient with us. By far, there was way more fun than frustration and I loved it!! Man, can I hit that ball! Mom was thrilled that I can catch, too. "Wyatt met a new milestone!!! At 41/2 he can officially catch a ball! This takes not only a huge amount of visual concentration but physical! Wasn't too long ago that he couldn't even bring his hands to midline..so excited for him! " SCHOOL'S OUT FOR SUMMER. WAIT, WHAT??? 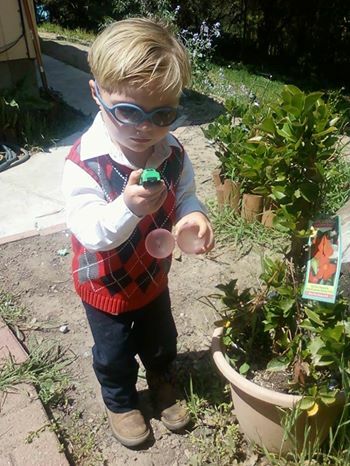 "For the 3rd time in the past couple weeks someone I never met came up to us while out and about to say hi to Wyatt! Couple teachers and a fellow coach..I love it. It's a reminder that while he's out at school, baseball, therapy, horseback etc.. not only is other people touching his life but he too is touching other peoples lives. He may not be able to do things others his age are doing but I can't help but feel like he's doing something bigger! I see him spread hope, joy and love and I know that's because others are spreading it on to him. Thank you to all who support Wyatt from the bottom of our hearts!" So for the summer, I will continue to practice my life skills and prep for the "big time" school. As long as I get some breaks. Those fish won't wait forever, you know! So, yeah, I'm still a bit on the short side, but I am no longer as scrawny as I was! I have been eating everything in sight and growing more and more solid! This has been proven by the noises Mom and Grandma make when they try and wrestle me into the car seat or carry me around for any length of time. Ugh! Sissies. My therapy with the horses continues and seems to really help to stretch my legs and hips. I just think they're cool and I like flirting with the ladies there. "We added an extra day a week of horseback today! Wy is going to start to learn to groom and will gradually learn to tack and lead the ponys:) So good for fine and gross motor skills as well as getting bonding time with the horses!" SPEECH - THE FINAL FRONTIER. EXPRESS YOURSELF! Ever tasted hot sauce? Nasty stuff!! Apparently it's the brilliant solution my parents believe may stop me from saying bad words. Honestly, I'm just practicing my verbal skills! Part of the "known" characteristics of the FOX P1 deletion is lack of complete sentence structure, one or two word formations being an expectation. Well, perhaps that may be partially true at this time for me but, man, if you are gonna spit out just a couple words then make them shockers, right? Especially in public. You should see the look on Mom's face. Hilarious. Actually, I can string together a ton of phrases and do not feel limited to single words at all. What are they thinking? I think I am really, really progressing with speech now! And I am brilliant when it comes to remembering words of songs. I think that helps me learn. Since my big brother Carter is learning to read, I get the benefit of many, many new words and sentences being repeated over and over. Hint, hint..parents, do this with your kid no matter what their abilities are. You may just be surprised! This is really important advice from me to you, whether it's with speech or whatever. Chromosome disorders are unique to each kid. There simply is no standard and no average. Don't ever let any doctor or therapist tell you that you won't be able to do something. They don't know it all! Just keep trying! Why not? This is me wearing my blue ribbon for Chromosome Disorder Research! I've also been working really hard on my grasp, my coordination, and how things go together and work. What seems like easy tasks are pretty tricky for a little guy like me when my hands want to do the "pincher grasp" thing. But check this out, I am getting the hang of it! Coordination has its benefits. I can now wake up at 2 a.m. and turn on the "Frozen" DVD all by myself! Gotta love it! RIDING INTO SUCCESS! YEE HAW! Howdy Pardners! How have y'all been? Me? Well, I've been doing some amazing things and learning more and more every day! In fact, I have learned so much that I'm pretty sure that Grandma and Mom won't have to type my messages for me much longer! I wanted to share some of my recent adventures and how they are helping me with the challenges of the pesky missing piece of Chromosome 3. I love horses! Oh my gosh! Mom discovered that therapy on horseback counts as respite care so it's a two for one benefit! The action of being horseback stretches the leg muscles and hips, one of the tight areas the doctors want to focus on. Here I am riding Ellie! I love her! If that wasn't enough excitement, I was invited to participate in the Special Buckaroos Rodeo - part of the BIG HUGE California Salinas Rodeo. Kids with all sorts of abilities were able to rope, ride horses and bust broncs and hang out with the clowns and bull riders! I got a trophy which I wouldn't let go of for anything. Yee haw! Here I am with by best buddy Chelsea, who helped me with the barrel racing! Busting broncs! The cowboys and cowgirls who helped us kids were super nice! My trophy rocks! Thank you so much Salinas Rodeo! Hi everyone! I know, I know. It's been such a long time! How have you all been? Life as a three year old can be pretty hectic! So much has happened since we last talked! Let me try and update you a wee bit. My preschool was involved in the Gifted Games again! OMG! I love running! I think I want to be a track star when I grow up. Like when I'm four. Do you remember when I had a walker? Run run run, as fast as you can..you can't catch me, I'm the Wyatt Man! I've posted a video on my therapy page to show my gait, how the issues with my muscles affect my walking and running. Mom thinks it's important for us to share details about development physically so our friends can learn. I experienced a real tragedy for a couple months. It was devastating. My blankie VANISHED. this was not your average everyday blankie. This was THE ONE. Mom tried new blankies and even sewed me one with a similar pattern, bless her heart. But it wasn't the same. There are almost three years of memories embedded in that scrap of fabric! How many of you know what I'm talking about? Do YOU have a lovey? A bear? A favorite toy? Man, it was tough. But then...randomly walking past the office at my brother's school, Mom saw blankie folded up on a desk. Could it be? Hallelujah! Reunited and it feels so goooood! UPDATE ON PROGRESS - THE EYES HAVE IT!! We are excited to report improvement in my eyesight! Part of the chromosome 3 deletion appeared for me as strabismus as a baby and extremely poor vision. 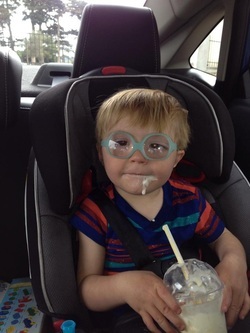 Here what Mom said after this last appointment, "Wyatt had quite the eye doctor appt. the other day but we survived and got some amazing news..one of his eyes went from a +6 to a +4.5! Quite the change and quite the difference from his other eye which is at a +6.5" . The best part is figuring out that transitional lenses make me feel SAFE and perhaps help with the sensitivity I have about wearing these dang things. What a great concept! I'm keeping them on MUCH more than I used to. Although there was that one unfortunate episode where I threw them out the car window....I think I would still be on time out if Mom hadn't spent an hour looking in the weeds and found them! OH YES, AND MY FAVORITE..THE FLUROSCOPY. "Was a little crazy as to be expected..I mean who doesn't love to be strapped down with cameras and doctors all around you shooting barium down your throat..Poor sweet boy! He wasn't in the best of moods so we didn't receive a full report then but unfortunately they did see penetration and this time on nectar consistency I'm just not sure why we went down hill but I am just so thankful we have not had any pnemonia - we are truly blessed! They literally told us to not bother getting another done until he is not coughing on water which I can't even imagine when that will be so I suppose that will be our last fluroscopy for a while. Should get a detailed report and call from GI soon. For now up our thickener and count our blessings. Trip back up there tomorrow to see pulmonology.."
"Super fun with all the noises and colors at the same time as being very challenging not only mentally but physically. You could see Wyatt really thinking and trying to problem solve. To add to the challenge is his dang muscles. We realized he is still tight in his shoulders/arms and lifting the beads over his head was hard he would bend over half way to over compensate. The tightness in his legs are still a big issue as well. I wish I had gotten pictures very fun and informative! Thought it would be a great activity for others learning to go through those motions as well:)"
So, you know me, I learn something at therapy and of course I want to try it at home. Not only am I learning to dress, but also to UNDRESS! Woo Hoo! Taking off my clothes at random times is a great way to keep my folks on their toes and is such a LIBERATING experience!! I also wanted to share this little video which demonstrates what I have really been working on. I am walking! I am climbing stairs. I am using open hands. I am thinking about different ways to have fun and being clever! It all looks so simple, but for me, these are big WOW moments! Make sure to check out out THERAPY tab for more ideas! Well hello there, friends! How is everyone doing? We have been busy as usual and I am especially settling into a routine of pushing my boundaries, finding my voice and asserting my likes and dislikes STRONGLY. Ha ha ha ha..the terrible twos have nothing on the terrific threes! Mostly I am extremely happy, adventurous and loving, but I think exploring my testy side is putting Mom through her paces some days. Here is Mom's Facebook update from my visit to the doctor yesterday. Not all great news regarding my reflux. I was not really a very happy camper but I DID get a lollipop. "Trip to the doctor today has lead us to the conclusion we will more than likely start more talk about surgery. Waiting on a call back from GI on what move she wants to make next. I would like a endoscopy to see the damage to his esophagus to see if surgery is absolutely necessary or if there is some other move we can make to help heal the wounds the acid reflux has made. It has also been a year since our last upper GI maybe theres another underlying cause to his spitting up that the upper GI would be able to show...not sure but I wish nothing but a problem free 2014 for this little man. No mother likes to see her baby have to go through so much and always admire the fact he just carries on with his tiny little voice, his charming personality, and addictive adorable smile despite the poking and prodding and appointment after appointment. Children are so resiliant..he is definitely my hero. On a positive note..WE GAINED A POUND!! whoo hoo that was with clothes on so it might be a tiny bit less but still..progress!" STRIKE UP THE BAND! IT'S NEW YEAR'S EVE! I would like to decipher the mysteries of the potty chair and what it means for me. Thus far my curiosity and enthusiasm has not resulted in much success but I am definitely getting the picture. Talk, talk, talk! You should hear me now! I am repeating EVERYTHING and really communicating my needs. I vow to do my best in therapy, particularly with stretching and working my muscles. I know sometimes it takes hard work to see progress but it does work! I will work with Mom & Dad and doctors to figure out my tummy issues, reflux and weight. Some days are just better than others right now, but I see that they are worried and I want that concerned look to go away! I will try hard not to yell at Mom and be sassy or throw things at my brother when I am ticked off or otherwise act like a three year old. Oh, wait. I AM a three year old. Never mind. We all resolve to continue to help others in any way possible to understand, accept and work with chromosome disorders. We have met so many kind, supportive peeps! Gotta always pay it forward!